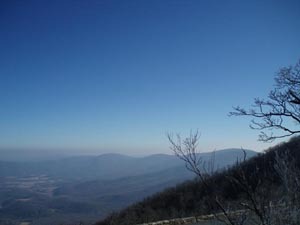 Description: The Elkwallow/Matthew's Arm area probably has the largest trail system than any other area in the North District of Shenandoah National Park. 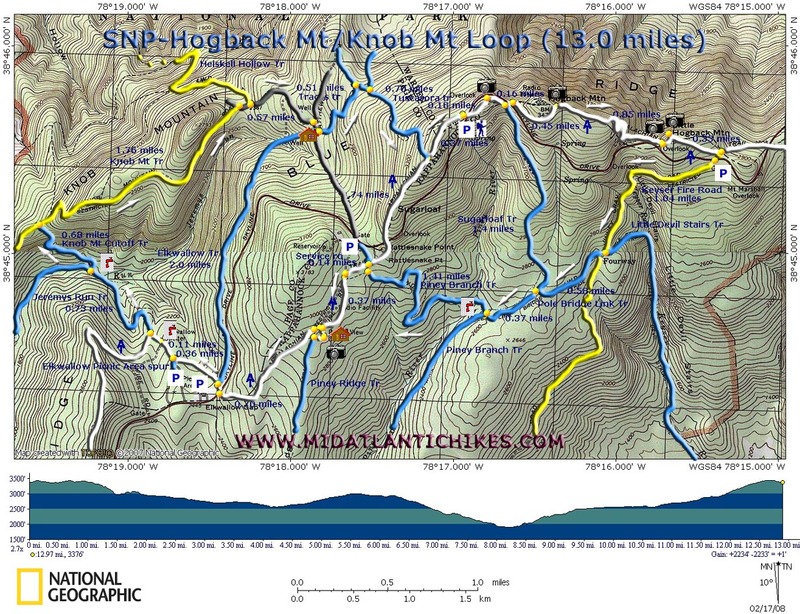 Using Hogback Mountain as the focal point one can create an infinite number of permutations ranging from 5.1 miles to 13.0 miles (even more if you are backpacking. Routes of approximately 30 miles can be made by adding either the Neighbor Mt/Jeremy's Run Loop , Knob Mountain/Jeremy's Run Loop, Little Devil's Staircase, Piney Ridge - Piney Branch, Piney Ridge - Thornton River Loop or others with very little backtracking.) and elevation gains of from 800 to 2570 feet. 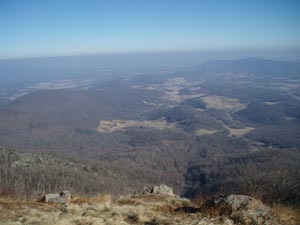 The most scenic hikes involve hiking the AT north from the Hogback Overlook parking area to the Keyser Run Fire Road. All of the best views are had in the first 1.5 miles regardless of which hike you do. We describe the longest and most strenuous circuit here with enough information to assist you in doing 3 other shorter hikes. 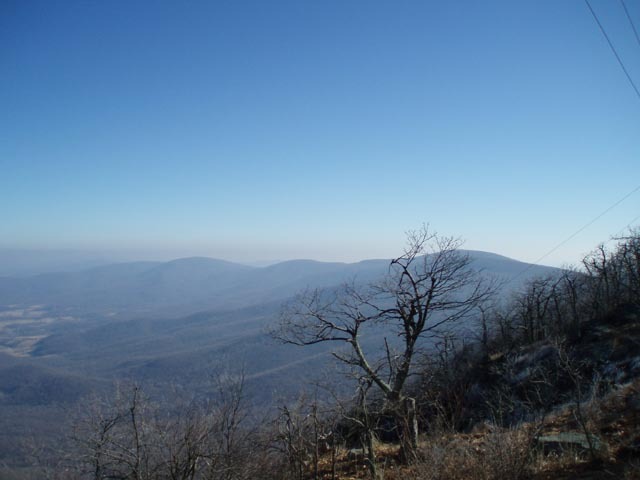 The hike starts in south end of the large parking lot just south of the Hogback Mountain Overlook (mile marker 21) and on the west side of Skyline Drive. Trail Notes: We will describe 4 hikes: Loop A - a 5.1 mile loop with 800 ft Elevation Gain, Loop B -a 6.61 mile loop with 1000 ft Elevation Gain, Loop C -a 10.3 mile loop with 1600 ft Elevation Gain and Loop D, a 13.0 mile loop with 2600 ft Elevation Gain. From the south end of the parking lot turn left (northbound) on the AT and soon cross Skyline Drive. In 0.18 miles reach the first vista. In another 0.16 miles pass the junction with the Sugarloaf Tr on the right. (This is your return route if doing the Loop A.) and soon cross Skyline Drive. The first couple of steps are along a service road that leads to a communications tower but you will quickly turn right onto a footpath following the white blazes. In 0.45 miles arrive at a great westward view. You can see Thompson Hollow and Matthew's Arm to the left and the area known as Brown Town straight ahead and the Marshall Mountains to the right. Continue northbound on the AT (actual compass reading is east at this point.). Descend from Hogback Mt via a set of switchbacks and in 0.85 miles from the last vista arrive at the next vista. As you descend you can catch glimpses of South Marshall Mountain and the odd shaped "Peak". Soon arrive at the last vista. In another 0.33 miles turn right onto the Keyser Fire Road spur, cross Skyline Drive and walk through a parking area to pick up the yellow blazed fire road. In 1.04 miles arrive at what is known as "Fourway". The blue blazed Little Devil Stairs Tr comes in from the left. The blue blazed Pole Bridge Link Tr is on the right. Turn right onto it. 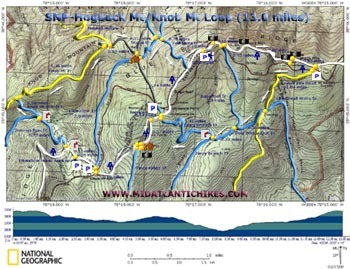 In 0.58 miles arrive at the junction with Sugarloaf Tr. If doing Loop A turn right here and climb back up to the AT. In 1.4 miles turn left onto the AT and follow it back to your car. To do one of the longer loops continue on the Pole Bridge Link Tr to the junction with the blue blazed Piney Branch Tr. Turn right and soon cross Piney Branch. Begin a long gradual climb and in 1.41 miles from the last trail junction cross a grassy surveyor's road and reach the junction with the AT. To complete Loop B turn right (northbound) here and climb 1.1 miles back to your car passing the Tuscarora Tr on the left near the end. To do one of the two remaining loops turn left (southbound) on the AT. Soon you will join a grassy service road that comes in from the right. In a short distance arrive at a spur trail on the left that leads to the Range View Cabin (locked and rentable through the PATC) and a spring. This is a good place for lunch if the Cabin is not in use. 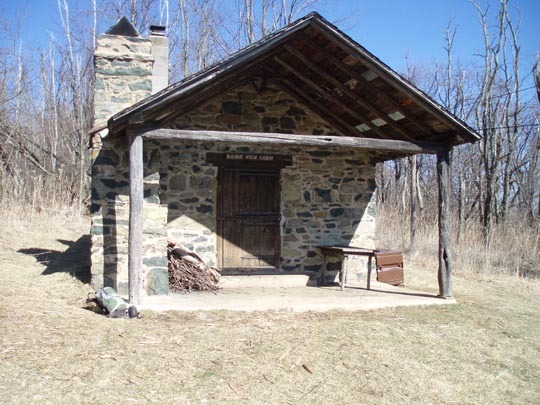 After lunch you can either retrace your steps and turn left on the AT or follow the service in front of the cabin to the trail post for the Piney Ridge Tr. Turn right here and in a few steps turn left onto the AT (a footpath at this point). 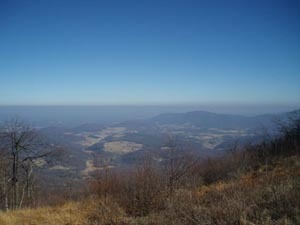 In 0.70 miles cross Skyline Drive and soon come to the junction of the blue blazed Elkwallow Tr. To complete Loop C turn right onto Elkwallow Tr and follow it for 2.0 miles to the Entrance Station for the Matthew's Arm Campground. Cross the road to a parking area for the amphitheater and take the blue blazed Traces Tr. In 0.51 miles the Traces Tr will go to the left. Turn right here and in a short distance turn right onto the Tuscarora/Overall Falls Tr and climb for 0.70 miles to the AT. Turn left onto the AT and in 0.37 miles arrive back at your car. If completing Loop D do not turn right onto Elkwallow Tr. Rather stay straight (southbound) on the AT. In 0.26 miles pass a spur trail on the left that leads to the Elkwallow Picnic Area. In another 0.11 miles pass a piped spring, also on the left. Shortly after that the AT will make a hard left turn. Continue straight, now on the blue blazed Jeremys Run Tr. In 0.73 miles turn right onto the blue blazed Knob Mt Cutoff Tr. 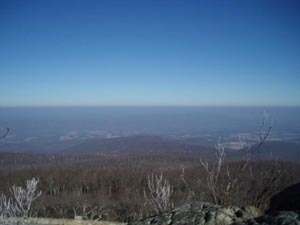 Cross Jeremys Run and climb for 0.68 miles to yellow blazed Knob Mt Tr. Turn right and follow it to its northern terminus in 1.76 miles. Turn right onto a gravel/asphalt service road. (A water treatment plant is across the road and to the left.) Soon pass Heiskell Hollow Tr on the left. In 0.57 miles arrive at the Entrance Station for Matthews Arm Campground to your right. Cross the road to a parking lot for the amphitheater and take the blue blazed Traces Tr. In 0.51 miles the Traces Tr will go to the left. Turn right here and in a short distance turn right onto the Tuscarora/Overall Falls Tr and climb for 0.70 miles to the AT. Turn left onto the AT and in 0.37 miles arrive back at your car. More views from the north side of Hogback Mt. Panoramic View from Little Hogback Mt: Hogback Mt to the left, Matthews Arm center, Brown Town to the right. 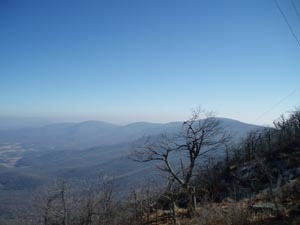 Critique: A group of 5 did the longest of the loops here (13 miles) as a short weekend overnighter in early fall, 2011. 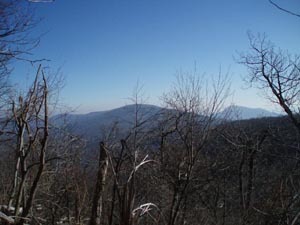 We hiked 9 on the first day and camped along Jeremy's Run near its intersection with the Knob Mtn Cutoff trail. On the hike out the next morning through Mathew's Arm campground we spotted two black bears. We spotted the first about 200 yards from our campsite near Jeremy's Run...the second scrambled down a tree about 20 yards from the trail as we approached on Knob Mountain. 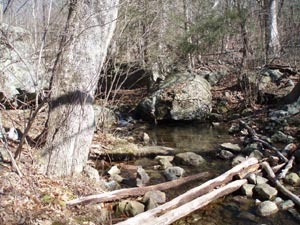 -There is not much for water--we only crossed 3 or so streams across the entire 13 miles. If you're camping out, plan to camp near one of the water icons on MRHyker's map. -If hiking in the fall/winter, dress warm. The forecast for Front Royal or other nearby towns can vary dramatically from the top of Hogback/other Shenandoah mountains. 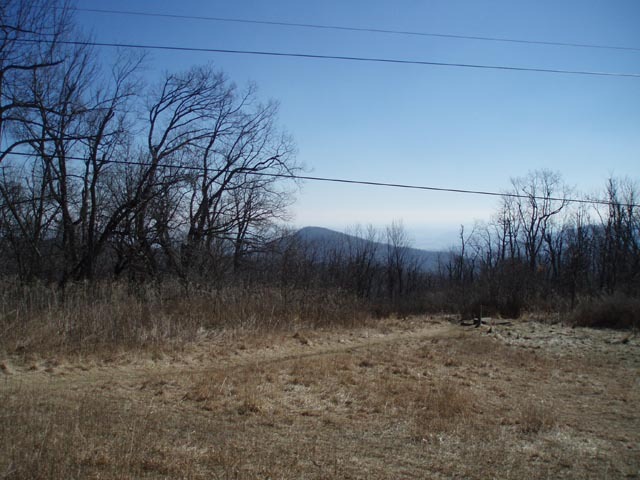 -You will cross Skyline Drive or other roads a number of times, and even pass near a gas station/general store at Elk Wallow. You can hear cars throughout stretches of the trail. This wasn't a problem for us, but you probably won't be pleased if you're looking for complete solitude. The hike offers plenty of side trails if you decide to shorten or lengthen your hike. Next I'll check out the Neighbor Mtn/Jeremy's Run. It's a similar distance and it appears you pass more water and fewer roads. Thanks for the map/directions MRHyker! Critique: Did the 10.3 mile loop version of this hike on a beautiful June day. The hike was quite nice, with some great overlook views. Also plenty of wildlife to watch, including a rattlesnake sunning itself on the Keyser Fire Road, and a black bear with her two cubs between Elkwallow and Matthews Arm. The only downside of the trail was its frequent proximity to Skyline Drive, and the associated noise. Overall a very nice hike that I would do again. Critique: Hiked this on a very foggy Sunday morning. Hiked "Loop A" the shorter of the hikes. Beautiful area, nice hike. Even with the fog generally obscuring our views, we found this to still be a beautiful hike. Will definitely do it again on a clearer day to enjoy the breathtaking vistas seen in the photos.